The Democrats and the Republicans are one and the same. 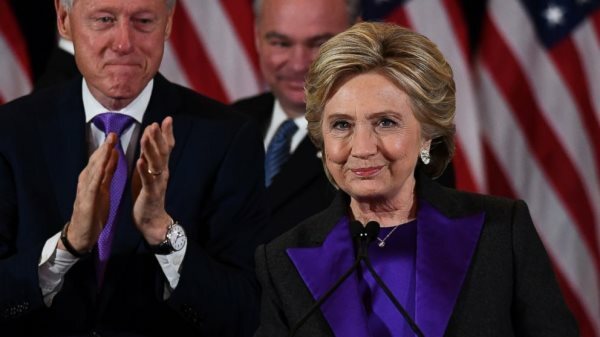 AFRICANGLOBE – When you study the results and the politics of the just concluded U.S. Presidential Election there is this treasure trove of valuable information that if properly understood explains exactly why Hillary Clinton lost the election. One of the most startling piece of information to some people is that, Donald Trump, a bigot and a white supremacist who bragged about grabbing women by the p*ssy got more votes from white women than Hillary Clinton did, which is a huge slap in the face of Black feminists who managed to fool themselves into thinking that they are females first, not Black First. They are slow to learn that white supremacy and racial oppression is a team sport and a family affair, GENDER DOES NOT MATTER, they are not killing you in the streets because you are female or male, they are killing you because you are Black, PERIOD. The much talked about Latino vote which was supposedly going to render the Black vote insignificant apparently never showed up to save Hillary, and Trump got almost as much of it as she did. Black voters are the only group that actually vote as a block, thus when all other groups are equally divided it is them who actually have the power to swing an election either way. It is also true that whenever Black people are enthusiastic about anything the rest of the society usually follow their lead, such was the case in 2008 and 2012 with the Obama candidacy. Black people were simply not enthusiastic about a candidate who bragged about the Violent Crime Control and Law Enforcement Act, the largest crime-control bill in US history. Signed into law by Bill Clinton it led to the mass incarceration of hundreds of thousands of Black men, women and children on petty and trumped up charges. Hillary was very active in promoting the legislation famously describing Black children as ‘superpredators’ in the process. Barack Obama and the Democrats basically distanced themselves from everything Black since 2008 when the community came out in record numbers to hand them victory over the Senate, the Congress and the Presidency, famously stating that he was not the president of Black America instead he was the President of The United States of America. They refused to publicly support the Black protest movement, Obama’s Justice Department made absolutely no effort to prosecute cops and vigilantes who are blatantly murdering Black people on a daily basis, in fact they worked with Republicans to pass “Blue Lives Matter” laws that did nothing to make police officers more accountable. They refused to address the funding disparities that exists between urban (Black) and suburban (white) schools, they did nothing to address the disparity in business loans awarded by the Small Business Administration to white and Black small business owners, or the almost zero government contracts awarded to Black-owned firms. They did nothing, besides paying the occasional lip service to the issue of justice reform and even less to end mass incarceration. Obama was willing to sign executive orders to protect illegal immigrants from being deported, to help Gays by dismantling the “Don’t Ask Don’t Tell” policy of the U.S. Military and also to guarantee women equal pay for equal work. When Israel needed billions for bombs, planes and tanks, Obama was there, but when it came to addressing Black issues, such as the bankruptcy of Detroit, the poisoning of the entire city of Flint’s water supply or the chronic Black unemployment rate, Black people were told that a ‘rising tide lifts all boats’ and that he cannot do anything for them specifically, lest the President risk looking like a tribalist. Black Voters Are Waking Up? A greater number of Black people are beginning to see the Democrats and the Clintons for the “superpredators” and liberal white supremacists that they are. They have no problem using racial dog whistles such as Hillary Clinton telling the ‘hard working white’ racist that she could understand why white people would feel threatened by a Black child wearing a hoodie after the murder of Trayvon Martin, not to mention Clinton Foundation’s nefarious, if not outright criminal acts in Haiti. Leaked email revealing that the Democratic National Committee (DNC) instructed Democratic presidential candidates during the primaries, not to support Black Lives Matter protesters. The fact that the notorious St. Louis County prosecutor Robert “Bob” McCulloch, who refused to charged killer cop Darren Wilson for the murder of Michael Brown was a Democrat who protected a killer cop while throwing thousands of Black people in Ferguson in jail for traffic tickets. Democrat Rahm Israel Emanuel, who served as White House chief of staff under Barack Hussein Obama, who later became Mayor of Chicago, had absolutely no problem conspiring with criminal State’s Attorney Anita Alvarez (who is also a Democrat) to hide the police murder of Laquan McDonald. He also had no problem closing down half of the schools in Chicago that were located in Black neighborhoods. All these acts of disregard, together, culminated in a feeling by many Black voters that neither Democrats nor Republicans took their interests seriously, and that both parties are just two sides of the same white supremacist coin. The above mentioned facts are just a few of the reasons why Black voters did not turn out in the same numbers as they did four years ago, there were no good guy on the ballot to vote for. Barack Obama was very protective of “his legacy”, publicly stating that he did not want to hand over the White House to a Republican administration, at the risk of having Trump and the Republicans repeal his most precious legislative achievements such as ‘Obamacare’. If Donald Trump actually carry out his promises, Barack Obama might go down in history, not as the first Black President, or the President who gave America universal healthcare, but as the President who gave America GAY MARRIAGE, and among Black people Hillary and Bill Clinton should forever be known as SUPERPREDATORS.